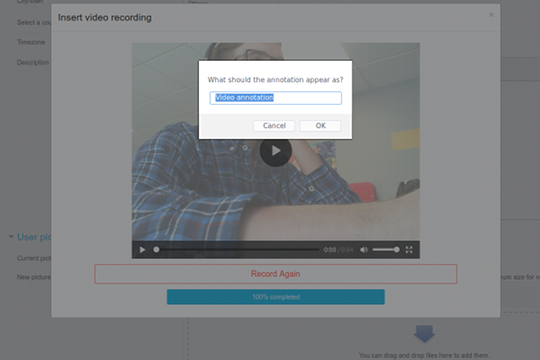 Add audio and video annotations to text, anywhere an Atto text editor is present. 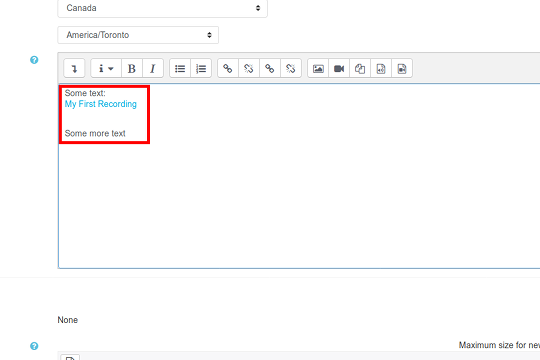 This plugin adds buttons for recording audio or video (with audio) to the editor's toolbar. Anyone has a problem with using this one on IPHONE's IOS, even using latest version of Chrome, Firefox or Opera? It raised the error with "WebRTC not supported" message. Is there any plan to handle recording retention? Something like an expiry duration so that everything recorded doesn't live on the file system of the Moodle box forever? Another question. 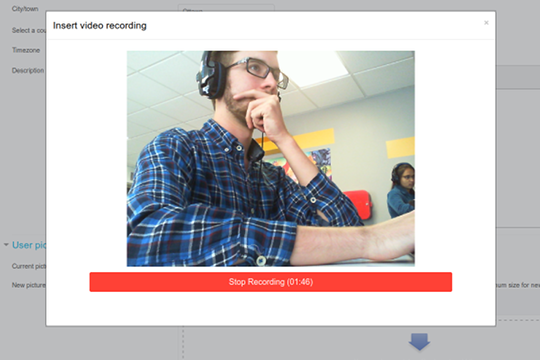 I can record audio or audio/video for a question, and feedback to questions in the Quiz module, but not respond to a question with audio or audio/video. I was hoping the html editor for an essay-type question would allow an audio response with RecordRTC for use by our language centre. b. It seems the icons are missing when grading/providing student feedback in the Assignment activity. It would be great if this would be available while grading to provide video feedback to students. To use your plugin it is essential to work in secure https mode. As part of a nomadic product like the MoodleBox, is it possible to disable this obligation? Jesus, like several other users I have several people asking if they could use this in the Assignment feedback areas. I'm pretty sure the limitation is that the file system API isn't implemented in the gradebook and that's where the feedback is stored (and the tracker item for that was marked closed - won't fix). I think that's why things like Poodll have been implemented as the assignment feedback plugin type. Any chance you would explore that? Indeed, we may. Although I am personally not a fan of doing things in the hacky way. Not for this plugin anyways. We just came back from the MootCA18. There is some interest on this topic and can bee seen here https://tracker.moodle.org/browse/MDL-60848. The only thing I can promise right now is to put this on the table again in a few weeks in the MootIEUK18. Also, the goal right now is to keep it as simple as possible and for that to happen, the less plugins the better. Believe me, it is not a trivial effort to keep them all updated . Would it be possible to have somewhere (in the docs page ?) a clear indication of minimal browser versions (by browser) supporting it? Because some institution keep using old browser versions, to be compatible with older applications/programs. It seems it doesn't work with Firefox 45.9.0, nor IE 11.0.96. It works OK with Firefox 60. I read your message from Mi, 13. Sep 2017, 21:53, Is it right, that the plugin is still not working on annotating comments? Now, when your Plugin is standard in Moodle 3.5, this would be sooo nice to have as a real game-changer! Please, let us know about your : "We'll keep an eye on that one"
The Plugin currently is not supported in Mac OS . Is there any plans to create another alternative for mac user? Thank you for your work on this plugin. I am trying to install it on Moodle 2.9, Atto toolbar. I have a live version of Moodle and a local based test site using MAMP on Mac OS 10.13. It worked briefly on the local version. 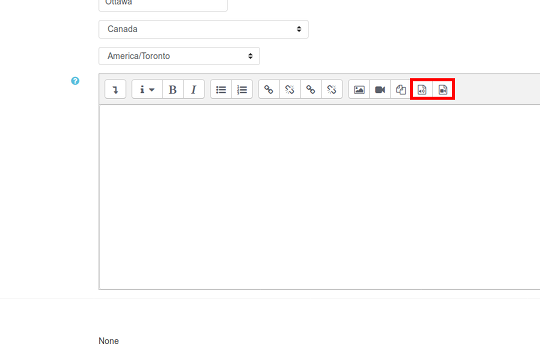 but now I cannot get the buttons to appear in the Atto toolbar on either live or local instals (Plugins/text editor/Atto HTML Editors/toolbar configuration). I'm pretty sure I've set the configuration is as it should be. Any ideas? Is it true it won't work with Mac OS? Any updates on this? I have noticed that Poodll does allow for audio and video feedback. We discontinued Poodll because now we have RecordRTC. But we just found out that RecordRTC doesn't have the ability to give audio or video feedback, where Poodll did. Thank you for creating such a great plugin. I'm wondering how I can download all submitted audio with the link, user ID and quiz number at once. It would be very helpful if you have an idea.